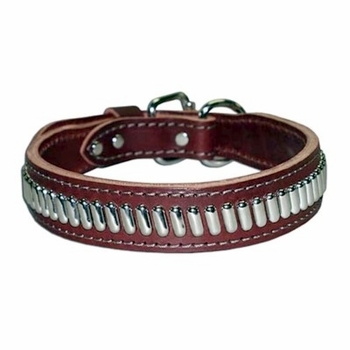 Our leather dog collar is made out of heavy duty 2-ply 1-1/4 inch wide leather and has oblong studs. 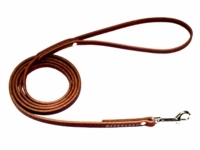 This leather dog collar tapers to 1 inch at the buckle for easier buckling and is double-riveted and stitched with heavy thread. This is a Dee-In-Front Style leather dog collar. A Dee-In-Front Style dog collar means the dee ring is located on the very end of the collar. This dog collar is available in colors Black or Burgundy and in sizes 19, 21, 23, 25 and 27. Our collars are sized from tip to tip. Please use a cloth tape measure to measure your dogs neck. To get the correct collar size add 4 inches to your dogs exact neck measurement. For example a 17 inch neck will need a size 21 dog collar. A 19 inch neck will need a size 23 dog collar.